Through an institutional license agreement, staff at the Swedish Radiation Safety Authority has now full Premium access to the Nucleonica applications and features. The Swedish Radiation Safety Authority reports to the Ministry of the Environment and has a mandate from the Swedish Government within the areas of nuclear safety, radiation protection and nuclear non-proliferation. The Nucleonica team looks forward to a close interaction with the Swedish Radiation Safety Authority colleagues and encourages a strong use of the web portal. Using the Date mode in the Decay Engine++ (DE++), if an historical activity is known, then the activity at any later time can be calculated (e.g. if the activity on January 1st 2011 was 3 kBq, what is the activity now?). But what about the question: if the activity now is 1.73kBq, what was it 23 months ago? 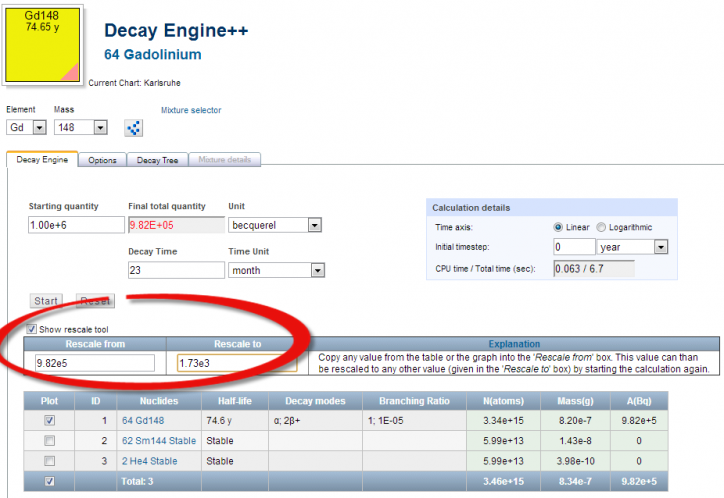 The Decay Engine++ can only handle positive time values. If a negative time is used, an error message will appear “The decay time should be a positive number”. However, it is very easy to investigate “negative” times by using the rescale feature. Consider the following example: a Gd-148 source has an activity now of 1.73 kBq. What was the activity 23 months ago? 1. In the Decay Engine++ select the nuclide Gd-148. Use the default activity of 1e6 Bq and set the decay time to 23 months (if larger decay times are used the results after 23 months can be obtained using the slider control in the Graph). The calculation results show that the activity drops from 1e6 Bq to 9.82e5 Bq after 23 months. 2. Use the rescale tool, to rescale the end activity from 9.82e5 Bq to the activity now 1.73e3 Bq (see graphic below). 3. Rescale by pressing the Start button. It can be seen that the activity 23 months ago was 1.76e3 Bq. It should be noted that this procedure only works for the parent nuclide.